Jacob of Serugh (Syriac: ܝܥܩܘܒ ܣܪܘܓܝܐ, Yaʿqûḇ Srûḡāyâ; 451 - November 521), one of the best Syriac authors, also spelt Serug or Sarug, named by one of his biographers "the flute of the Holy Spirit and the harp of the believing church," was born at Kurtam, a village on the Euphrates to the west of Harran, and was probably educated at Edessa. At an early age he attracted the attention of his countrymen by his piety and his literary gifts, and entered on the composition of the long series of metrical homilies on religious themes which formed the great work of his life. Having been ordained to the priesthood, he became periodeutes or episcopal visitor of IJaura, in Sërugh, not far from his birthplace. His tenure in this office extended over a time of great trouble to the Christian population of Mesopotamia, due to the fierce war carried on by Kavadh II of Persia within the Roman borders. When on January 10, 503 Amid was captured by the Persians after a three months' siege and all its citizens put to the sword or carried off as captives. A panic seized the whole district, and the Christian inhabitants of many neighbouring cities planned to leave their homes and flee to the west of the Euphrates. They were recalled to a more courageous frame of mind by the letters of Jacob In 519. At the age of 68, Jacob was consecrated bishop of Batnan, another town in the district of Serugh, but he only lived until November 521. From the various extant accounts of Jacob's life and from the number of his known works, we gather that his literary activity was unceasing. According to Barhebraeus (Chron. Eccles. i. 191) he employed 70 amanuenses and wrote in all 760 metrical homilies, besides expositions, letters and hymns of different sorts. Of his merits as a writer and poet we are now well able to judge from P. Bedjan's edition of selected metrical homilies (Paris 1905-1908), containing 146 pieces. They are written throughout in dodecasyllabic metre, and those published deal mainly with biblical themes, though there are also poems on such subjects as the deaths of Christian martyrs, the fall of the idols and the First Council of Nicea. Of Jacob's prose works, which are not nearly so numerous, the most interesting are his letters, which throw light upon some of the events of his time and reveal his attachment to the Miaphysite doctrine which was then struggling for supremacy in the Syrian churches, and particularly at Edessa, over the opposite teaching of Nestorius. Jacob of Serugh. A HOMILY of MAR JACOB of SERÛGH ON THE RECEPTION OF THE HOLY MYSTERIES. Transl. Dom Hugh Connolly, (O.S.B.). The Downside Review Vol.27 (1908), pp.278-287. 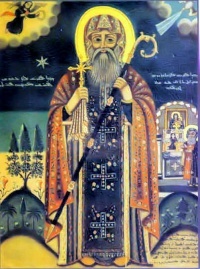 Jacob of Serugh. A homily of Mar Jacob of Serugh on the memorial of the departed and on the eucharistic loaf. Transl. Dom Hugh Connolly, (O.S.B.). The Downside Review Vol.29 (1910), pp.260-270. This volume is a collection of studies on the Syriac sixth century writer Jacob of Sarug by a team of international scholars, including Susan Ashbrook Harvey, Sebastian P. Brock, Sharbil Iskandar Bcheiry, Khalid Dinno, Sidney Griffith, Mary Hansubry, Amir Harrak, George A. Kiraz, Edward Mathews, Aho Shemunkasho, and Lucas Van Rompay. The papers were presented on the occasion of the 50-year celebration of the establishment of St. Mark’s Syrian Orthodox Cathedral in NJ. Fr. Dr. James Puthuparampil, O.I.C., (Syro-Malankara Catholic Church). Mariological Thought of Mar Jacob of Serugh (451-521). Kottayam, Kerala, India: St. Ephrem Ecumenical Research Institute (SEERI.ORG), 2005. 380pp. Chorbishop Seely Joseph Beggiani. The Typological Approach of Syriac Sacramental Theology. Theological Studies Vol. 64 No. 3 (2003). pp.543-557. Dr. Volker-Lorenz Menze. “Jacob of Sarug, John of Tella and Paul of Edessa: Ecclesiastical Politics in Osrhoene 519-522.” In: Malphono w-Rabo d-Malphone: Studies in Honor of Sebastian P. Brock. Ed. G.A. Kiraz. Series: Gorgias Eastern Christian Studies, Vol.3. Gorgias Press, 2008. pp.421-438. Prof. Susan Ashbrook Harvey. “Bride of Blood, Bride of Light: Biblical Women as Images of Church in Jacob of Serug.” In: Malphono w-Rabo d-Malphone: Festschrift for Sebastian P. Brock. Ed. G.A. Kiraz. Gorgias Press, 2008. pp.189-218. Sebastian Brock (D.Phil.). Saints in Syriac: A Little-Tapped Resource. Journal of Early Christian Studies, 01 Jul 2008. Sebastian Brock (D.Phil.). Jacob of Serugh on the Veil of Moses. Sobornost No. 3 (1981), pp.70-85. Sebastian Brock (D.Phil.). Baptismal Themes in the Writings of Jacob of Serugh. Symposium Syriacum 1976, Orientalia Christiana Analecta (OCA) Vol. 205 (Rome: 1978), pp.325-47. A. L. Frothingham, Jr. (Ph.D.). Historical Sketch of Syriac Literature and Culture. The American Journal of Philology, Vol. 5, No. 2 (1884), pp. 200-220. I. H. H.. Review of: "L'Omelia di Giacomo di Sarug sul Battesimo di Costantino Imperatore pubblicata, tradotta ed annotata da ARTHUR L. FROTHINGHAM, Jun. Roma, coi tipi Salviucci, 1882." In: The American Journal of Philology, Vol. 4, No. 2 (1883), pp.222-224. Eugène Hyvernat. "James of Sarugh." In: The Catholic Encyclopedia (New Advent). Vol. 8. New York: Robert Appleton Company, 1910. Prof. Christof Eberhard Nestle (Ph.D., Th.D.). "Jacob (James) of Sarug." In: The New Schaff-Herzog Encyclopedia of Religious Knowledge. (12 VOLS). Vol. VI: Innocents-Liudger. New York and London: Funk and Wagnalls Company, 1910. p.79. Rev. Charles James Ball (M.A.). "Jacobus Sarugensis, bp. of Batnae." In: Very Rev. Henry Wace (D.D.) and William Coleman Piercy (M.A.). Dictionary of Christian Biography and Literature to the End of the Sixth Century. London: John Murray, 1911. pp.327-328. Rev. De Lacy O’Leary (D.D.). The Syriac Church and Fathers. London; SPCK, 1909. (see pp.114-16). Syriac Computing Institute. Syriac Hypertext Project Demo: Jacob of Serugh, Mar. Jakob von Sarug at the German Wikipedia. JAKOB von Sarug (Serugh). Biographisch-Bibliographisches KIRCHENLEXICON. Last update: 11.02.2009. This page was last edited on February 19, 2011, at 14:44. This page has been accessed 24,970 times.